The beauty of the world! The paragon of animals! It is ironic that science, in its pursuit of knowledge, may soon lead us to understand that we are not what we believe or desire ourselves to be, that we are not the most knowledgeable life-form on the planet. Biological science is provoking us to shatter our image of human superiority. Confronted with new realities, we may be forced to change our perceptions. For the first time in our history, a small group of scientists stands on the threshold of communicating with a non-human intelligence. Probing the oceans instead of deep space, they are searching for an ATI (Alternative Terrestrial Intelligence). Astronomers devoted to SETI (Search for Extra Terrestrial Intelligence) keep our collective inquisitive ears tuned for signs of sentience from space. At the same time, cetologists observe, document and decipher evidence that points to a profound intelligence dwelling in the oceans. It is an intelligence that predates our own evolution as intelligent primates by millions of years. Furthermore, it is an intelligence that may prove to be far superior to us in terms of complex associative, linguistic and survival abilities. Dr. John Ford’s patient monitoring of the speech of orcas off British Columbia has revealed distinctive dialects between orca populations, so distinctive that it is possible to link a captive animal of unknown origin with its long-lost family in the wild. In the cold waters off Patagonia, Dr. Roger Payne thrilled the world with his recordings of the songs of the humpback whale. Behind the aesthetic value of whale music, Payne’s research has revealed fascinating insights into the complex and highly sophisticated language of whales. In the realm of zoological study, no other family of species has had such a profound impact upon human researchers. A few brilliant researchers have even been accused of losing their scientific objectivity simply because their study of cetaceans revealed knowledge about themselves. You see, wrote Dr. John Lilly, what I found after twelve years of work with dolphins is that the limits are not in them, the limits are in us. So I had to go away and find out, who am I? What’s this all about? Dr. Paul Spong, who came to the study of cetology as a psychologist, found himself transformed into a devout advocate of dolphin freedom. I came to the realization, says Spong, that at the same time I was manipulating their (orca) behavior, they were manipulating my behavior. At the same time I was studying them and performing experiments on them, they were studying me and performing experiments on me. Both men have taken to heart an advice: eloquently expressed by novelist Edward Abbey that, It’s not enough to understand the natural world, the point is to defend and preserve it. Other scientists have told me that they understand this effect that cetaceans have on people and resist the tendency to become involved with their subjects only from fear of ridicule from other scientists. Knowing something is so does not mean that others will accept it or even be open-minded enough to ponder it. Some things are just not on the table for serious scientific debate and the idea that humans are subordinate in intelligence to another species is one of them. Dolphins and whales do not display intelligence in a fashion recognizable to this conditioned perception of what intelligence is and thus for the most part, we are blind to a broader definition of what intelligence can be. I have observed whales and dolphins in the wild for fifty years, seeing varied and complex behavior that has displayed a definite pattern of sophisticated social interactions. They have exhibited discriminatory behavior in their dealings with us, treating us not like seals fit for prey but as curious objects to be observed and to be treated with caution. They can see beyond to the manifest technological power that we have harnessed and they can adjust their behavior accordingly. It is a fact that there has never been a documented attack by a wild orca on a human being. Perhaps they like us. More likely they know what we are. The interpretation of behavior remains subject to the bias of the observer; one observer can classify behavior as intelligent and a second observer will dismiss the same behavior as instinctive. There is also the tendency to be anthropomorphic — to attribute human feelings and motives to the behavior of nonhumans. Until we can actually talk with a nonhuman, it is difficult, if not impossible, to do anything but speculate on what is being thought or perceived. We cannot even understand with any certainty what a human being from a different culture, speaking a different language, may be thinking or perceiving. Even among people of our own culture, language, class, or academic standing, it is a formidable task to peer inside the workings of the brain. In this respect all brains other than our own are alien and I might venture to add that the inner workings of our individual brains are still a mystery to each of us that possess one. Homo neanderthalensis is an example of a species that possessed both technology and media communication. This tool-maker created haunting images of its experiences and environment. Some Neanderthal tools, artifacts and cave art from the Chatelperonian period have survived and remind us that we are not the only species capable of material artistic expression. Neanderthal ivory and bone carvings were used for adornment in addition to more practical purposes. Symbols carved on antlers relating to the movement of animals in relationship to the seasons indicate that Neanderthals may have invented "writing,’ and carried a hunting almanac around with them. The foundation of the mammalian brain is the paleocortex, sometimes called the reptilian or ancient brain. The paleocortex segment reflects the primordial fish-amphibian-reptile structure. This basal combination of nerves is called the rhinic lobe (from the Greek rhinos, for nose) because it was once believed to be the area that dealt with the sense of smell. The poorly developed rhinic lobe is overlaid by the slightly more advanced limbic lobe (from the Latin limbus, for border). On top of this lobe is overlaid the third and much larger segment called the supralimbic lobe. Draped over these three lobes is a cellular covering called the neocortex, meaning "new brain." This is the instantly recognizable, fissured, convoluted layer that envelops the other two more primitive segments. The neocortex is a bewilderingly complex community of intertwined axonal and dendritic nerve cells, synapses and fibers. The mammalian brain is a complex layering or lamination of evolutionary processes that reflects hundreds of millions of years of progressive development. The billions of electrochemical interactions within this complex organ define consciousness, awareness, emotion, vision, recognition, sound, touch, smell, personality, intuition, instinct and intelligence. The first factor in determining the mammalian stages of development is the number of brain laminations. The layering of the neocortex differs greatly between humans and other land animals. The expansion of the neocortex is always forward. This means that neocortex development can be used as a fairly accurate indicator of the evolutionary process of intelligence. We cannot assume, however, that the determining factor in comparative intelligence is neocortex mass. The other factors considered in the equation are differentiation, neural connectivity and complexity, sectional specialization and internal structure. All these factors contribute toward interspecial measurements of intelligence. Interspecies comparisons focus on the extent of lamination, the total cortical area, and the number and depth of neocortex convolutions. In addition, primary sensory processing relative to problem solving is a significant indicator; this can be described as associative ability. The association or connecting of ideas is a measurable skill: a rat’s associative skill is measured at nine to one. This means that 90 percent of the brain is devoted to primary sensory projection, leaving only 10 percent for associative skills. A cat is one to one, meaning that half the brain is available for associative ability. A chimpanzee is one to three and a human being is one to nine. We humans need only utilize 10 percent of our brains to operate our sensory organs. Thus the associative abilities of a cat are measurably greater than a rat but less than a chimp, and humans are the highest of all. Comparisons of synaptic geometry, dendritic field density and neural connectivity underscore the humbling revelation that the cetacean brain is superior to the human brain. In addition, the centralization and differentiation of the individual cerebral areas are levels higher than the human brain. Many of us may remember our lessons from Biology 101. We were shown illustrations of the brain of a rat, a cat, a chimp and a human. We listened as the instructor pointed out the ratio of brain to body size and the increased convolutions on the neocortex of the human over the chimp, the cat, the rat. The simplistic conclusion was an understanding that humans were smarter. Of course, it was a human demonstration of intelligence and the conclusion was arrived at by discrimination based on the selection of the examples. When the brain model of an orca is inserted into the picture, the conclusion based on the same factors places the human brain in second position. Humans have the rhinic, limbic and supralimbic, with the neocortex covering the surface of the supralimbic. However, with cetaceans we see a radical evolutionary jump with the inclusion of a fourth segment. This is a fourth cortical lobe, giving a four-fold lamination that is morphologically the most significant differentiation between cetaceans and all other cranially evolved mammals, including humans. No other species has ever had four separate cortical lobes. This well-developed extra lobar formation sandwiched between the limbic and supralimbic lobes is called the paralimbic. Considering neurohistological criteria, the paralimbic lobe is a continuation of the sensory and motor areas found in the supralimbic lobe in humans. According to Dr. Sterling Bunnell, the paralimbic lobe specializes in specific sensory and motor functions. In humans, the projection areas for different senses are widely separated from one another and the motor area is adjacent to the touch area. For us to make an integrated perception from sight, sound and touch, impulses must travel by long fiber tracts with a great loss of time and information. The cetacean’s paralimbic system makes possible the very rapid formation of integrated perceptions with a richness of information unimaginable to us. Despite Biology 101, brain-to-body ratio is not an indication of intelligence. If this were so, the hummingbird would be the world’s most intelligent animal. Brain size in itself, however, is important and the largest brains ever developed on this planet belong to whales. More important is the quality of the brain tissue. With four lobes, greater, more pronounced neocortex convolutions and superior size, the brain of the sperm whale at 9,000 cc or the brain of the orca at 6,000 cc are the paragons of brain evolution on the Earth. By contrast, the human brain is 1,300 cc. And by point of interest, the brain of a Neanderthal was an average 1,500 cc. Apart from our collective ego as a species, the idea of an Earthling species more intelligent than ourselves is difficult to swallow. We measure intelligence in strictly human terms, based on those abilities that we as a species excel at. Thus we view hand-to-eye coordination as a highly intelligent ability. We build things; we make tools and weapons, manufacture vehicles and construct buildings. We use our brains to focus our eyes to guide our hands to force our environment to conform to our desires or our will. Whales cannot or do not do any of the things we expect intelligent creatures to do. They do not build cars or spaceships, nor can they manage investment portfolios. Cetaceans do have built-in abilities like sonar that put our electronic sonar devices to shame. Sperm whales have even developed a sonic ray-gun, so to speak, allowing them to stun prey from a head filled with spermaceti oil to amplify and project a sonic blast. However, we expect an intelligent species to arrive in a spaceship armed with laser rayguns, bearing gifts of futuristic technologies. This is a fantasy that we can understand, that we yearn for. For us, technology is intelligence. Intelligence is not a naked creature swimming freely, eating fish and singing in the sea. Most modern humans believe that we are vastly more intelligent compared to our ancestors of 75,000 years ago or even 10,000 years ago. Our technology is proof, is it not? The fact is that the brain of a person living today is identical in size and composition to that of our kind from tens of thousands of years ago. If you were to set Einstein’s brain beside the brain of a cave-dweller of the Paleolithic era, you would not be able to find a single difference in size or complexity. Our technology is cumulative, the end product of millennia of trial and error. It is also exponential and we now live in the time of the most rapid exponential growth. Individually, the average cave-dweller of the past could match the average citizen today in associative intelligence and would be as capable of learning. Our intelligence is also cultural and the vast amount of information that we have at our disposal lies outside of ourselves as individuals. Apart from the community, we are severely limited in understanding or manipulating technologies. Left to our own resources on an undeveloped island, most of us would have absolutely no idea how to survive. We do not even have the knowledge to construct rudimentary stone tools or weapons. In this respect stone age humans would be our intellectual superiors. If we look at the comparative intelligences of species strictly on a morphological basis, judging all aspects on cortical structural development alone, we can assign an average associative score relative to human intelligence. Let’s assign the average human brain a score equal to 100. This is the number we consider average on human IQ tests. Based on associative skills as defined by the physiological structure of the comparative brains, we will find that a dog scores about fifteen and a chimpanzee around thirty-five. These are scores that are comfortably within our understanding of intelligence. Based upon comparisons of cortical structure alone, a sperm whale would score an IQ of 2,000. The truth of the matter is that we know absolutely nothing about what goes on in the brain of a whale or a dolphin. In our ignorance, we resort to the arrogance of denial and dismissal. We deny the physiological evidence and in general we have denied that other animals can think or even feel. We forget that all mammals have climbed the evolutionary ladder with us and some, like the whale, started climbing that ladder tens of millions of years before we evolved from that apelike ancestor that we shared with the Neanderthal, the chimp and the mountain gorilla. The whale has evolved in a different manner, its natural physical abilities giving it little cause to desire material baggage. The spear was not needed to get food — the whale is one of the most efficient hunters in natural history. The whale’s ability to travel, to communicate, to care for its young and its complex social systems are all separate from external material acquisition. Whales have biologically evolved what we utilize technology to achieve. Technology is something that the whales have never needed. They contain all the assets needed for survival and development within their massive bodies and formidable brains. 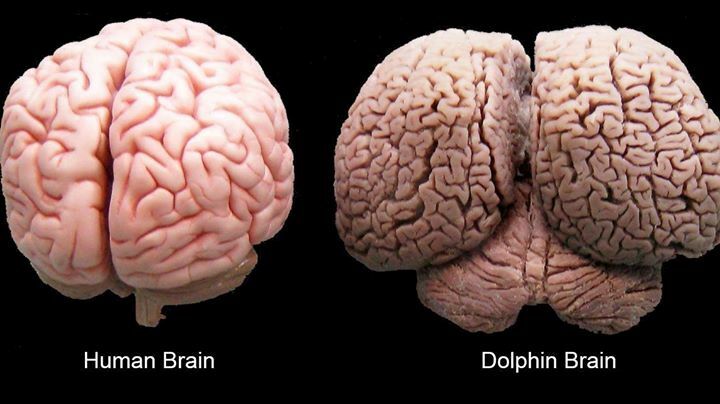 Another major difference between the cetacean and human brain is the shape. The cranium of the whale evolved over millions of years to conform to the need for streamlined movement through the water. This need has shaped the brain, making it higher, but shortening the length front-to-back slightly. And this shape has resulted in a relatively thinner layering of the cortex that is more than compensated by the much greater surface area of the neocortex due to the tremendous in-folding of the convolutions. According to Pilleri and Gihr, dolphins, toothed whales and primates have the most highly differentiated brains of all mammals and Krays and Pilleri showed through electroencephalographical studies that the Amazon River dolphins have the highest degree of encephalization, much higher than primates. Construction of the cortex was found to be equal or superior to primates. Cetaceans are the most specialized mammalian order on the planet and we see intelligence in dozens of species. By contrast, Homo sapiens are the sole surviving hominid. Humans may be the paramount tool-makers of the Earth, but the whale may be our paramount thinker. We can only imagine how a dolphin perceives the stars, but they may well do so better than we. Indeed, if the power of such an awesome brain could be utilized, travel to the stars might have already been achieved. The mind can travel to realms that rockets can never reach. Or perhaps they have already discovered that the ultimate destination of a voyager is to arrive back where it belongs -- in its own place within the universe. The desire to travel to the stars could very well be an aberration, a need within a species that has been ecologically deprived. Intelligent species here or else where in the universe may have determined that space travel is not the ultimate expression of intelligence. It may only be the ultimate expression of technology: technology and wisdom may be widely diverse expressions of different forms of intelligence. Intelligence can also be measured by the ability to live within the bounds of the laws of ecology— to live in harmony with one’s own ecology and to recognize the limitations placed on each species by the needs of an ecosystem. Is the species that dwells peacefully within its habitat with respect for the rights of other species the one that is inferior? Or is it the species that wages a holy war against its habitat, destroying all species that irritate it? What can be said of a species that reproduces beyond the ability of its habitat to support it? What do we make of a species that destroys the diversity that sustains the ecosystem that nourishes it? How is a species to be judged that fouls its water and poisons its own food? Imagine being able to see into another person’s body, being able to see the flow of blood, the workings of the organs and the flow of air into the lungs. Cetaceans can do this through echo-location. A dolphin can see a tumor inside the body of another dolphin. If an animal is drowning, this becomes instantly recognizable from being able to "see" the water filling the lungs. Even more amazing is that emotional states can be instantly detected. These are species incapable of deception, whose emotional states are open books to each other. Such biologically enforced honesty would have radically different social consequences from our own. 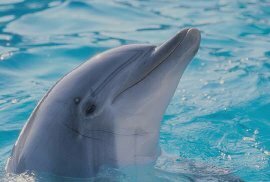 Utilizing their skill at echo-location with elaborate detailed mental images of what they "see" through auditory channels, dolphins may be able to recreate and transmit images to each other. In other words, whereas our language is analog, cetacean language is digital. With the invention of the computer, we are now communicating with each other digitally and this may be the key to unlocking the doors of perception into cetacean communication. The possibilities are fantastic. Instead of communicating across the vast expanse of space, we may be able to bridge the chasm between species. But we will not be able to say that "we come in peace." The tragic reality is that we will be speaking with species that we have slaughtered, enslaved and abused. We can only hope that they will be forgiving of our ignorance. If so, the future holds a place for the exchange of knowledge, the secrets of the seas, alternative philosophies and unique and different perspectives. I can envision the words of the whales translated into books. Instead of just listening to the music of whale song, we will be able to understand what the songs convey. This may open up new horizons in literature, poetry, music and oceanography. Most importantly, we will learn the lesson that we cannot presume to judge intelligence based upon our own preconceptions, prejudice and cultural biases. In so doing, we will be able to understand that we share this Earth with millions of other species, all intelligent in their own manner and all equally deserving of the right to dwell in peace on this planet that we all call our home — this water planet with the strange name of Earth. They say the sea is cold, but the sea contains the hottest blood of all and the wildest, the most urgent. Pilleri, G. Behaviour Patterns of Some Delphinidae Observed in the Western Mediterranean . Some information based on conversations over the last two decades with Dr. Michael Bigg (orcas), Dr. John Ford (orca dialects), Dr. Roger Payne (whale communication) and Dr. Paul Spong (orcas). the hottest blood of all and the wildest, the most urgent. on and on and dive beneath the icebergs. in the clasp and the soft, wild clutch of a she-whale’s fathomless body. and dreaming with strange whale eyes wide open in the waters of the beginning and the end. This essay was written by Captain Paul Watson. I added formatting and headings. It makes many of the same points I tried to make in my own Cetacean Intelligence essay.